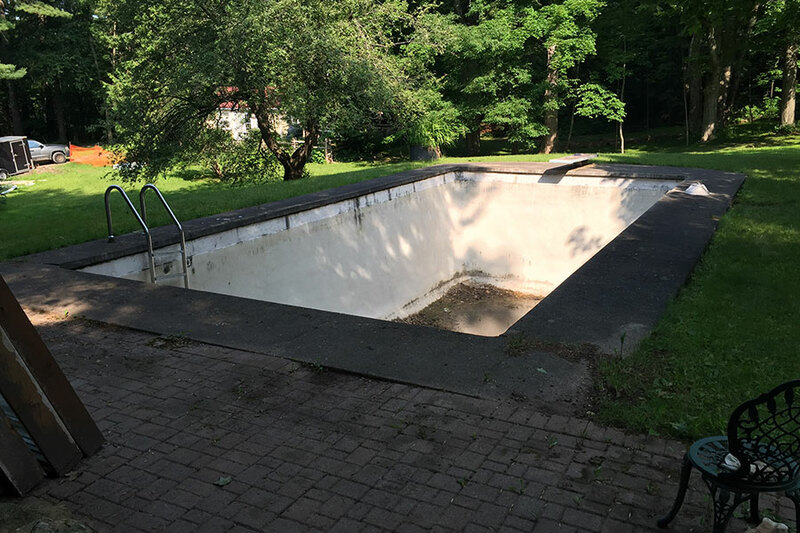 This concrete pool is in a desolate state and overdue for a pool renovation. The pool was built in the 1950’s and the aging process has not been gentle. 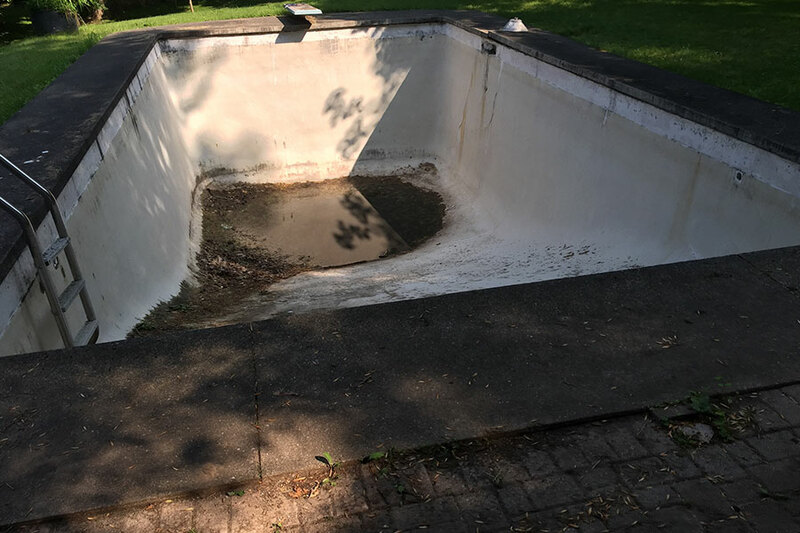 It was losing water due to concrete cracking through the vintage pool shell. The plumbing lines and fittings were decayed and needed serious TLC. The pool’s patio has well outlived it’s intended lifespan and has weathered away over the years. The patio has heaved concrete sections and a loose and dangerous diving board and ladder. To top this project off the pool waterline tiles were also falling off. A closer look at this pool before the project started. 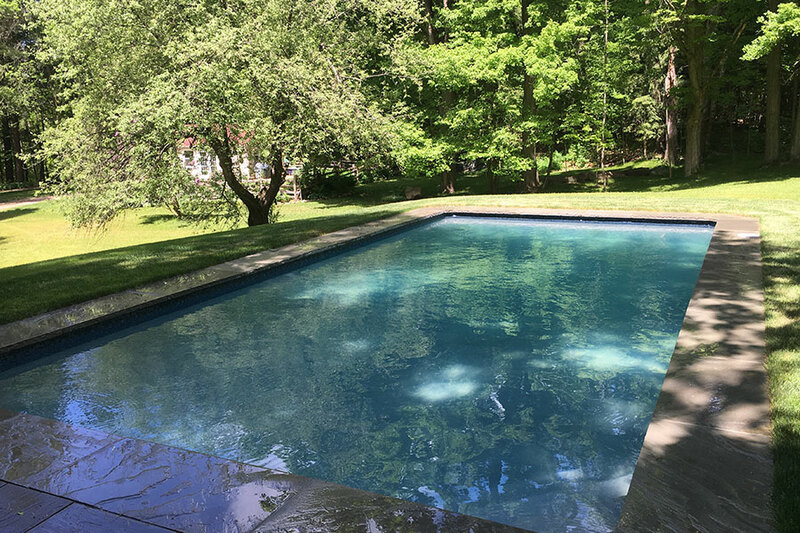 The pool was run-down and unusable space that needed some obvious repair. Despite the poor state, there definitely was potential for the concrete pool to be restored into something brilliant. 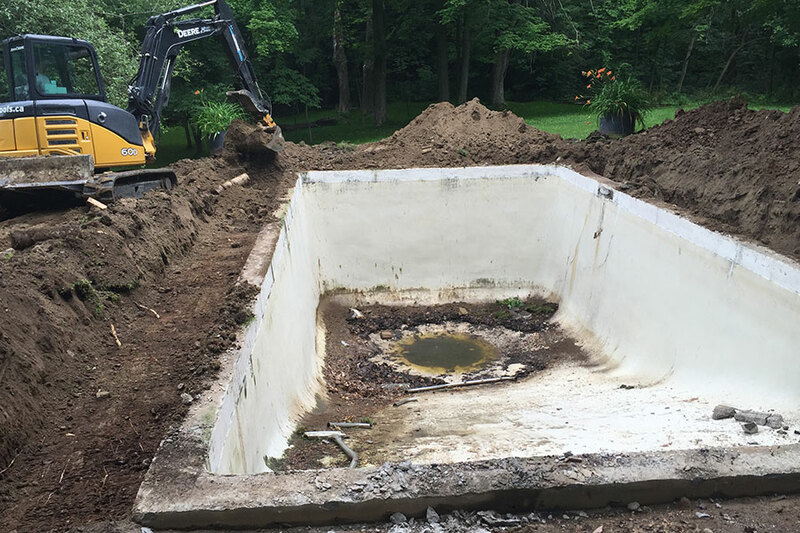 Excavation around the pool walls provides an opportunity to remove the old pool plumbing lines and replace them. We also roughed in new pool lighting and water jets. 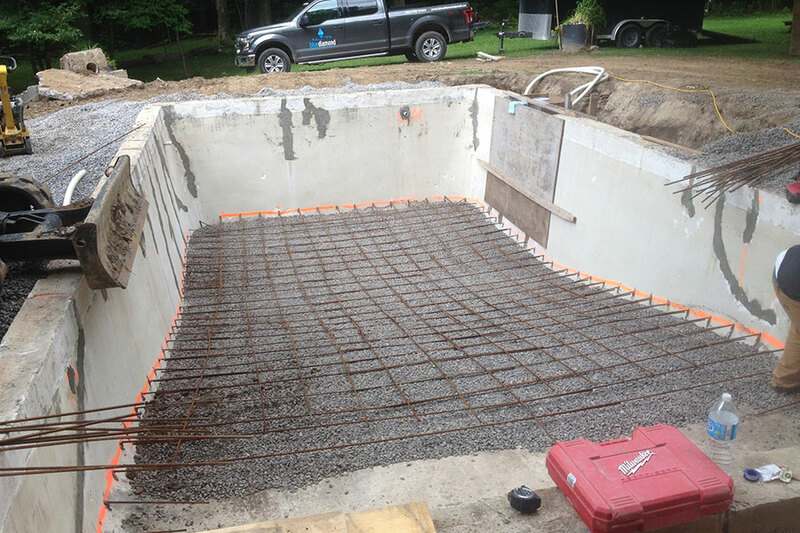 The deep end of the pool is shallowed from 8 feet to 5 feet as per the client’s request. 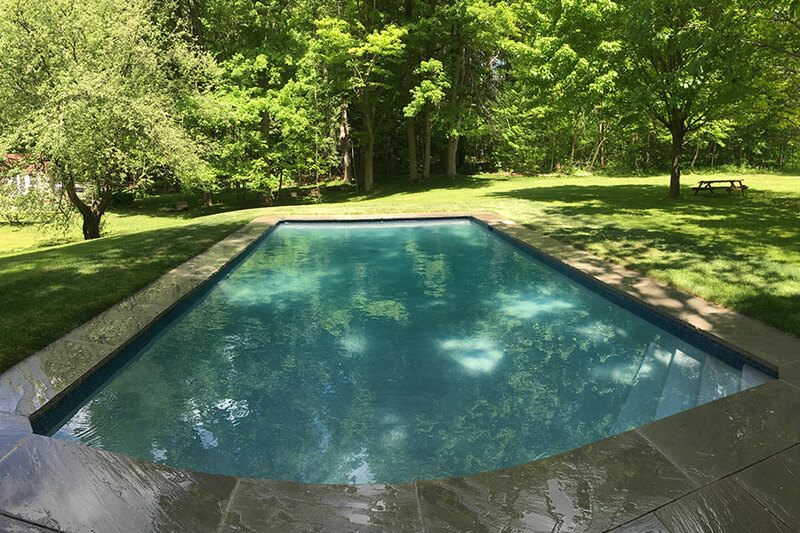 We managed to achieve this by adding compacting clean granular fill to a specific compacting rate followed with the installation of a heavy gauge rebar to ensure a structurally sound pool shell. 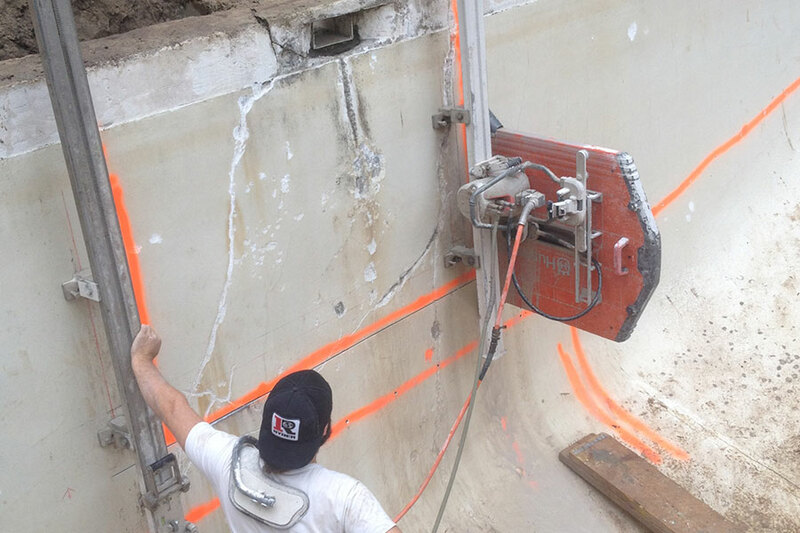 We also addressed the pool shell cracking during this stage by injecting a specific commercial grade Epoxy into the problem areas to ensure for a watertight shell in the future. 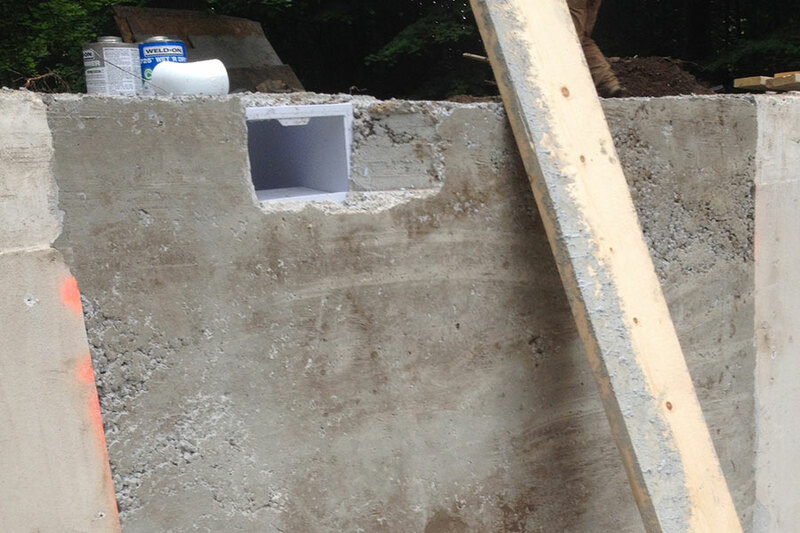 A large portion of the wall that was unable to be saved was removed along with the old leaking pool skimmer. 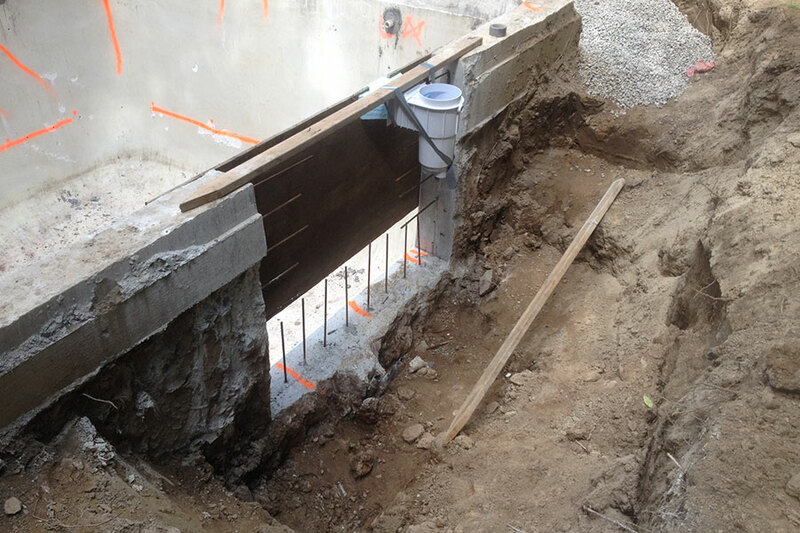 The section of the pool wall that has been removed was also reinforced using rebar, then reformed with an addition of a new wide mouth pool skimmer. 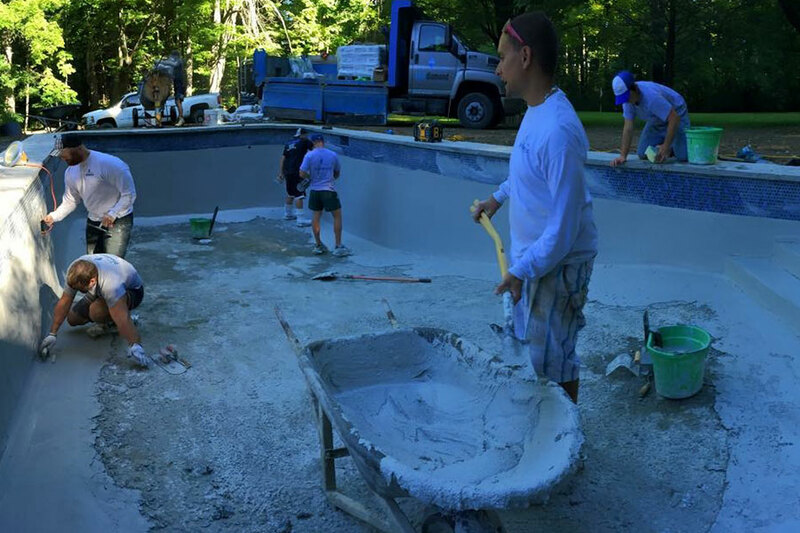 The new section of the pool shell was poured in using a high strength and low shrinkage concrete mixture. To ensure a watertight Seal water-stop membranes were added between the new skimmer and between the new and old sections of the pool. 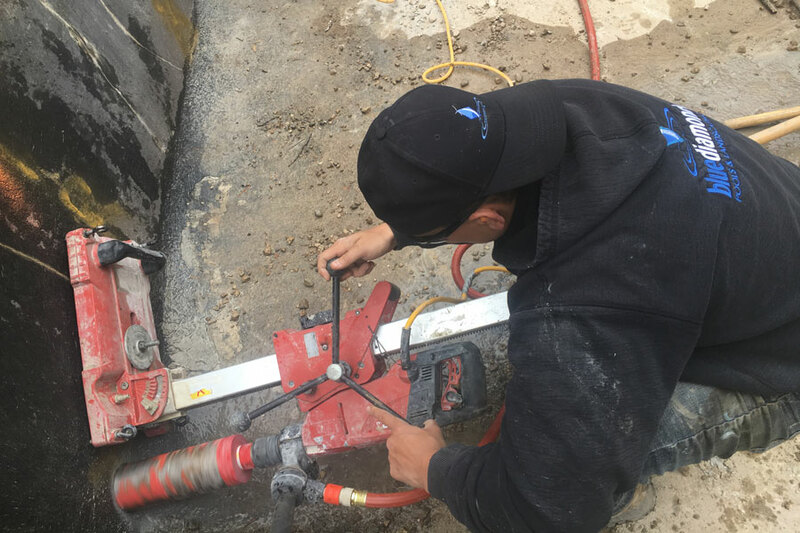 Following the improvements to the pool’s foundation, the Blue Diamond team cored holes through the pool’s shell for installation of the new plumbing lines and pool lights. The installation of a new glass Mosaic waterline tile was the next step. The client requested removing the current shallow end ladder. 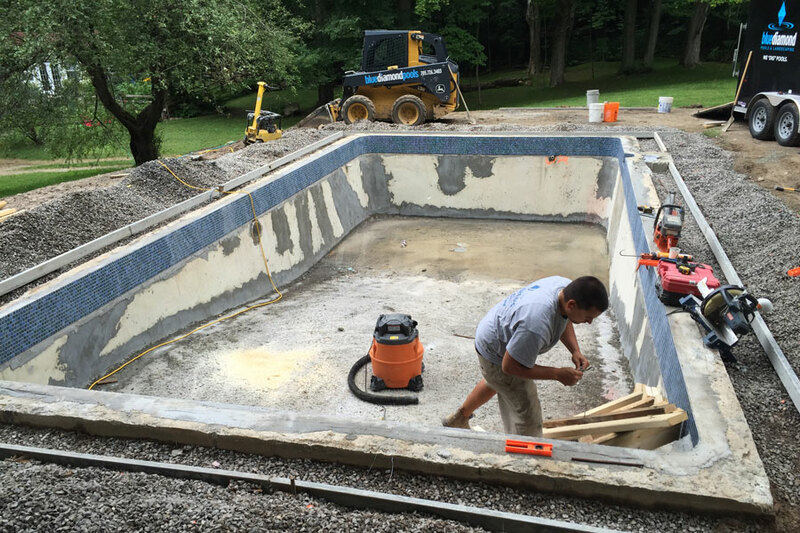 This task was tackled by adding new “Pour in place” walk-in steps to the corner of the pool. These steps can function as a place to walk into the pool as well as a place to sit and soak. The Blue Diamond Pool’s and Landscaping team is finally ready to give this old pool a new clean and crisp look. This was accomplished by pouring Tahoe Blue Plaster “Pool Marbelite” on the walls and floor of the pool. This new plaster “Marbelite” brings the plaster and waterline tile together in a way that complements the design of the pool. 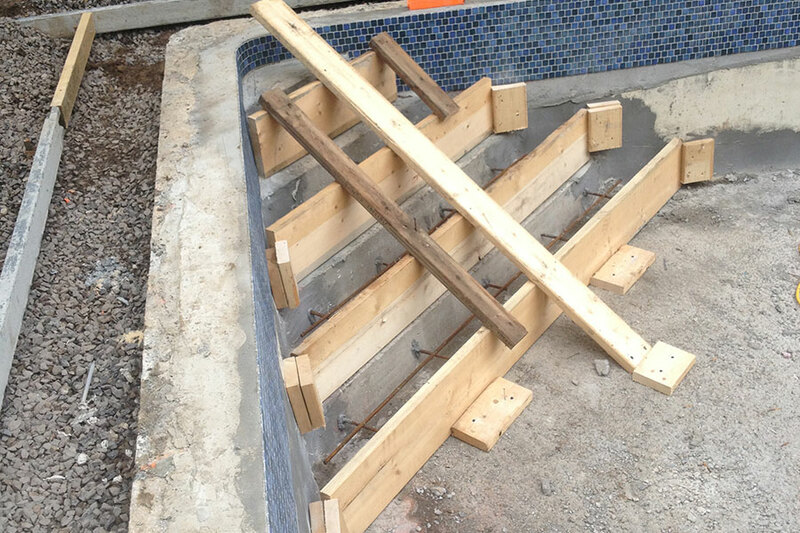 Natural stone pool coping was added along with new high efficient Hayward Pool Equipment installed. Finally, the time has come to fill the pool with water. Not only was this project a great experience, giving the homeowners what they were dreaming of, the project also went along to win awards at the respected Pool and Spa’s Council Construction Awards!